The United States Congress designated the Headwaters Wilderness (map) in 1984 and it now has a total of 22,047 acres. All of this wilderness is located in Wisconsin and is managed by the Forest Service. 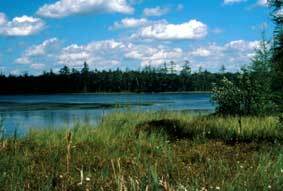 The largest of Wisconsin's Wildernesses is characterized by generally flat terrain with forested swamps and muskeg, and bog lowlands overlooked by a few hardwood ridges. The headwaters of Pine River, a legally protected Wild River, lie within the area. In the southern portion, you'll find the Giant Pine Grove and Shelp Lake, where some of the largest and oldest trees of Nicolet National Forest grow. The quiet waters of Shelp Lake, shadowed by towering pines on the southwest Wilderness boundary, are worth a peek. Deer hunting, bass fishing, hiking, and a chance for solitude lure people to Headwaters. The area is subdivided into three sections: The northern half for the most part consists of the Kimball Creek Unit, drained by Kimball and several other creeks. The Shelp Lake Unit lies in the southwestern portion, with Shelp Lake in the southwest corner. Finally, Headwaters of the Pine Unit comprises the southeast portion. While all three units are crisscrossed with trails off Forest Service roads that border the entire Wilderness, only 2.25 miles of system trail are maintained. Planning to Visit the Headwaters Wilderness? How to follow the seven standard Leave No Trace principles differs in different parts of the country (desert vs. Rocky Mountains). Click on any of the principles listed below to learn more about how they apply in the Headwaters Wilderness.